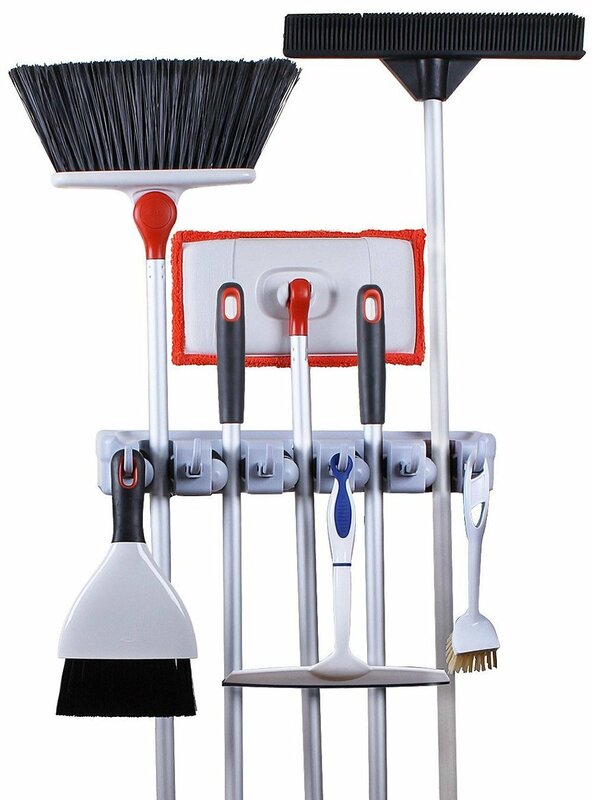 I just got this awesome broom organizer from Greenco. I have a pretty small cleaning closet/pantry so I am always trying to figure out how to fit everything into the closet and have it look neat and organized. What usually happens is everything gets put in and then it always seems like I need the one item that’s at the back of the closet so I have to pull everything out in order to get to it and then it’s a huge mess again. So I was super excited to try out this broom organizer!! This is a strip that you can hang up on the wall then it has five spots that you can insert broom/mop handles and it holds them in place. It is adjustable so it fits any size broom or mop handle. We hang up all of our cleaning tools, I have my broom, mop, swiffer, and duster on mine. It comes with the screws you need to hang it. The other thing that I love about this is that there are hooks you can pull down (six of them) and you can hang items on the hooks. It’s perfect for things like dust pans or anything that has a strap handle or a hole that you can place on a hook. Now I can easily organize my cleaning supplies into one device. I actually put this up on the wall across from the pantry and it works great. Everything is up out of the way, but I can easily get to all of my items. It holds things well, we put ours up this last weekend and it has done a great job of holding all my cleaning tools!